We’ve heard it a million times from the two Tristar teammates, bros before belts. 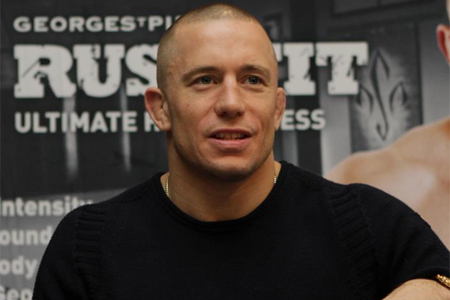 Reigning UFC welterweight king Georges St-Pierre (pictured) and protégé Rory MacDonald have professed they will never fight each other, but given the direction of their respective careers, it’s hard not to see they’re on a collision course. UFC president Dana White, for one, isn’t convinced they won’t tango. Especially when MacDonald realizes how much money he’s leaving on the table. If St-Pierre beats Johny Hendricks on Saturday, it will mark his eighth straight title defense – a UFC record in the division. He’s in need of fresh meat, and although he gets a taste of MacDonald every day in practice, it’s different when the lights come on. From MacDonald’s perspective, he hasn’t been shy about expressing his desire to capture the 170-pound strap. However, that makes no sense because he’d have to go through GSP to get it. He’s pretty much fulfilled all the prerequisites to earn a crack at the crown, but refuses to push for it because his buddy is still sitting atop the throne. Things could get really messy between the two if a fight comes to fruition, a la Jon Jones and Rashad Evans, but White doesn’t believe GSP and MacDonald’s divorce will be nearly as bitter. “I don’t think it will, because I honestly believe I know Georges St-Pierre. I know what a professional he is,” White said. “When has Georges St-Pierre ever not fought someone who deserved to be next? When has Georges St-Pierre ever done that? Georges St-Pierre has never been one of those champions where he’s like, ‘I don’t think this guy should be fighting me, this guy doesn’t deserve to be here.’ He’s like, ‘Who’s next? You think this is the guy that’s next? Then that’s the guy I’ll beat.’ That’s the way Georges St-Pierre has handled his career. White’s a promoter, so it’s his job to put the best guys in the Octagon and see who comes out with their hand raised. That’s why he claims it’s St-Pierre’s responsibility to give “Ares” his shot. Of course, this is all moot if either of them lose on Saturday. But there’s no way that can happen, this drama is just starting to unfold.